Affordability periods will end for the first 23,000 Low-Income Housing Tax Credit (LIHTC) units in 2002. Their expiration will launch a new round of preservation activity. The LIHTC portfolio now stands at approximately 750,000 units, increasing by 62,500 a year. By 2002, the portfolio will include almost one million units -- comparable in size to the U.S. Department of Housing and Urban Development (HUD) affordable-housing portfolio now facing its own preservation challenges. Thanks to the preservation awareness prompted by concerns over HUD's portfolio, Congress has promoted tax-credit preservation through a 15-year affordability extension passed in 1989, as have some states through a variety of allocation and financing tools. Yet for these efforts actually to result in preservation of affordable housing, a wide range of players -- including state and federal legislators, state housing agencies, local housing administrators, investors and owners -- still face the tasks of assessing the economics of preservation and implementing appropriate strategies. If continued affordability is a goal, it is now time to prepare. 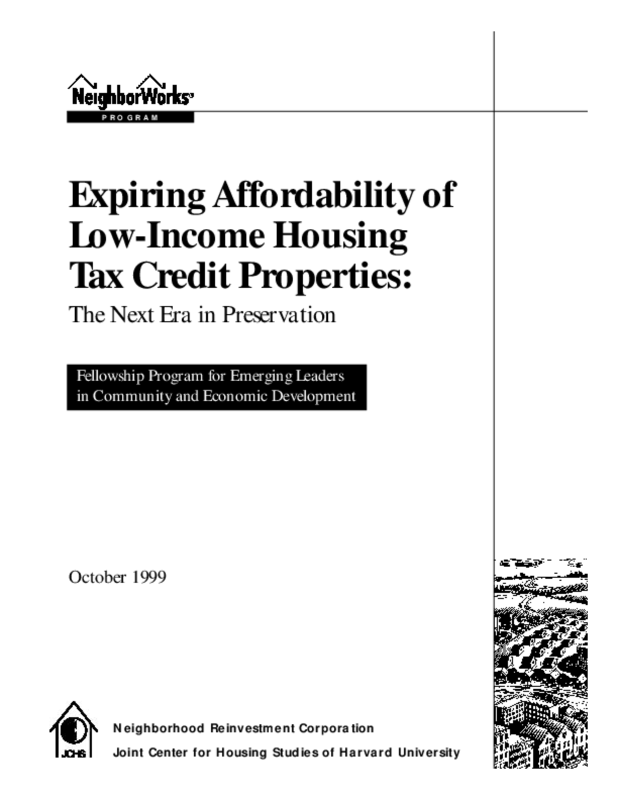 This paper outlines the issues -- including data availability, monitoring and enforcement needs, financial resources and response coordination -- surrounding preservation of tax-credit properties, with the aim of initiating discussion between the housing and policy communities prior to 2002. Copyright 1999 Kate Collignon. The Neighborhood Reinvestment Corporation (dba NeighborWorks® America) has full rights to use and distribute this document.